Don't be the guy in the gym that everyone hates! Find out the 'dos and don'ts' of gym etiquette and stay on the right side of your barbell-lifting buddies. Sweat Man: Use Your Towel! You get to meet people, work out and sometimes you can learn new ways to improve your diet or make changes in your fitness routine to help you gain more muscle. However, for every positive there is a negative. 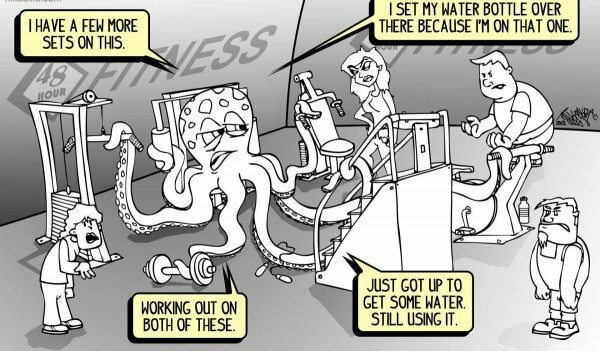 ​Some people at the gym think that it’s their own personal workout space, and they are very inconsiderate of others. In this article, you’ll learn how to NOT be the guy that people avoid at the gym. The gym is a great place to meet new people and socialize, but there is a limit to socializing. One guy that you don’t want to be is mighty mouth. This man comes to the gym with one goal in mind. That goal is talking. He talks to you before you’re getting ready to lift heavy weights. He talks to you while you’re doing cardio. He may even talk to you while you are in the middle of a set and trying to squeeze out that last rep. This behavior is not only distracting, but it can be dangerous. ​When doing strength training, you have to make sure your form is perfect so you don’t injure yourself. If someone is talking to you while you are preparing to do a set or during a set, it makes it very difficult to concentrate and can potentially lead to injury. Everyone sweats. If you go to the gym and workout hard, you’ll probably be sweating profusely by the end of your workout. Sweating is not the problem. The problem is that some people sweat heavily and don’t use a towel to cover the bench they are resting on or don’t clean the bench after they’ve used it. Certain diseases can be transmitted through the surfaces of exercise equipment, so it’s a really good idea to wipe down gym equipment before and after you use it. In addition to this, it also shows common courtesy to your fellow fitness enthusiasts. There are some people who go to the gym and they act like they know everything there is to know about training and fitness. They will tell you that you have to drink three protein shakes a day or you won’t gain an ounce of muscle. They will tell you that only bench presses will build muscle or that you can never do any type of cardio because cardio will destroy your lean mass. This guy, while having the best intentions, is a very dangerous character. Spot man goes around the gym waiting to “help” people who seem like they might be having problems lifting weights. He’ll generally appear behind you or at your side without the slightest nod or word from you. One minute you are lifting the weight alone (perhaps you are working a little harder to get the weight up, but you can do it alone). The next minute he is there lifting the weight with you. Don’t be spot man. Some of the greatest muscle gains come from struggling with the last few reps. This is where the muscle fiber will get torn and, with proper rest and nutrition, it will be repaired and you’ll get stronger and more muscular. This guy doesn’t have the slightest idea what the word consideration means. Just picture this. It’s 7 p.m. on a Tuesday night and the gym is very crowded. ‘EquipmentMan’ has commandeered three benches. His towel is draped on one bench. His cell phone is on another and on a third he’s placed some other personal item. You politely approach him and ask if you can use one of the three benches and he gruffly states that he is doing supersets or some other nonsense that absolutely requires the use of 3 benches. Equipment hog man not only tries to take over benches, but you might see him in the squat rack doing bicep curls or standing next to the cardio machine for 15 minutes while talking on the phone. The best way to enjoy your workout sessions at the gym is to be mindful of the fact that it’s not your personal gym. You pay monthly or yearly fees to rent the equipment while you are at the gym, but you must remember others are doing the same thing. Be courteous of your fellow gym goer by only striking up conversations when it is appropriate, wiping down and sharing equipment, and only offering to spot someone when they ask you to. Above all, leave the broscience for the cafeteria at work. It has no place in the gym.